Dr Eric Hong Cho Tek is one of the very few cardiologists who is doubly accredited after being trained in two ACGME ( Accreditation Council for Graduate Medical Education, USA) clinical fellowships of interventional cardiology and non-invasive cardiac imaging (including cardiac CT angiography, PET/SPECT imaging, nuclear cardiology). Apart from managing all general cardiac conditions, Dr Hong has special interests in interventional cardiology ( femoral and radial access), sports cardiology, cardiac rehabilitation and nuclear cardiology / non-invasive cardiac imaging including cardiac CT angiography, PET/SPECT imaging. He is also accredited to perform renal denervation procedure, an emerging therapy for hypertension. Dr Eric Hong Cho Tek received his medical degree from the Royal College of Surgeons in Ireland in 1996 and passed the United States Medical Licensing Examinations (USMLE) the following year. He worked in Ireland before returning to Singapore to start his specialist training in internal medicine. After completing his basic specialist training in internal medicine at Singapore General Hospital , he obtained his MRCP and became Member of Royal College of Physicians (Edinburgh). 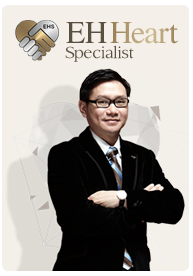 Dr Eric Hong commenced his advanced Specialist training in cardiology at National University Hospital in 2003. He passed the certification examinations of the American College of Sports Medicine (ACSM) in 2005. In recognition of his professional and research achievements, Dr Eric Hong Cho Tek was inducted as a Fellow of the Academy of Medicine Singapore (Cardiology) in 2006. He also received the Health Manpower Development Plan award in cardiology from Ministry of Health, Singapore. Dr Eric Hong became the first Singaporean to be accepted in the clinical programmes at Department of Cardiology, Brigham & Women’s Hospital, Harvard Medical School where he completed two clinical fellowships. He obtained his subspecialty training in Advanced Multimodality Cardiac Imaging at the Brigham & Women’s Hospital/ Harvard Medical School ( USA ) where he trained with Professor Marcelo Di Carli, an eminent nuclear cardiologist who is the world’s authority on CT/ PET imaging. Dr Eric Hong became a diplomate of the Certification Board of Nuclear Cardiology CNBC in 2006. He was also a clinical fellow in interventional cardiology at the Brigham & Women’s Hospital/ Harvard Medical School (USA) under the preceptorship of Dr Jeffrey J Popma. Dr Popma is a world renonwed interventional cardiologist who was previously president of the Society for Cardiac Angiography and Interventions (SCAI) and is the current chairman of the American College of Cardiology Cardiac Catheterization Committee and Ad Hoc Committee on Simulation Training. Dr Eric Hong Cho Tek became board eligible in interventional cardiology ( ACGME, USA ) in July 2007. At Harvard, he was also involved in the R&D of the latest cardiovascular imaging modalities, new isotopes and new generation stents used in interventional cardiology. He returned to Singapore to work as a cardiologist (heart specialist) in Department of Cardiology, National University Hospital where he was Director, Nuclear Cardiology and Imaging ; Director, Exercise and Cardiac Rehabilitation at National University Hospital . Dr Eric Hong was also Clinical Tutor at Yong Loo Lin School of Medicine and Chairman, NTLC, National University Hospital, Singapore . He was a consultant cardiologist at Tan Tock Seng Hospital from Nov 2009 to Oct 2010 where he helped to set up and deliver 24-hours-a-day, 7-days=a-week acute interventional cardiology service for heart attack patients. He also anchored the multimodality cardiac imaging in Tan Tock Seng Hospital. In January 2009, Dr Eric Hong became inaugural faculty at 1st ACT (Asan Medical Center Interventional Cardiology Training Program) at Asan Medical Center , the largest hospital in Korea. He was also faculty at 15th ANGIOPLASTY SUMMIT-TCTAP 2010 in Seoul. Throughout the years, he has won numerous service excellence awards, including Clinical Excellence (EXSA) Star 2008, Gold 2007, NHG Pillar Award Oct 2008, Hospital Superstar award Feb 2006, June 2006, Aug 2005 and COURAGE award 2003. He has been elected as Fellow of the American College of Cardiology, Fellow of the American Society of Nuclear Cardiology, Fellow of the Royal College of Physicians, Fellow of the European Society of Cardiology, Fellow of the Society for Cardiovascular Angiography & Interventions (USA) and Fellow of Asian Pacific Society of Interventional Cardiology. Dr Eric Hong Cho Tek, is accreditated to admit and manage patients in various hospitals in Singapore, including Mt Elizabeth Hospital, Gleneagles Hospital , Parkway East Hospital , Mt Alvernia Hospital and Raffles Hospital He continues to hold position of visiting interventional consultant cardiologist to the Department of Cardiology, Tan Tock Seng Hospital .